One observation, looks like the car is burning up lot of gas during idle/slow speed. Idle rpm/speed is also seems to be higher then all previous cars/suvs I owned. Probably another reason why they made idle off a default setting. Awd A-Spec 1500 miles 21 mpg with 75% highway on midgrade 89 octane. I'm averaging 24.5 mpg in comfort mode driving on mountainous roads in the Hudson Valley region of NY. I commute about 84 miles per day and drive about 70 mph on the highway. I have about 850 miles on the car so far and plan on trying Sport mode this week to see if there's a noticeable difference. Ours is sitting at 21.3, most of that being a 1100 mile round trip to Orlando. 93 octane. 28.3 mpg on a 1000 mile round trip all on interstate with Top Tier Costco premium gasoline driving in comfort mode on flat terrain the whole way, driving at 72 mph most of the time. Light traffic so I could keep a steady speed not often having to wait behind trucks passing trucks and then accelerate which can eat up the gasoline a little quicker. I think this is as good as it gets for my vehicle at that speed, understanding that I could potentially get higher mpg if I were to drive at a slower speed. Gtssenior-This is encouraging. Is yours SH-AWD or the FWD version? SH-AWD - Advance trim with the tires that were on it when I purchased it. I took a long road trip (over 1,000 miles) on Nov 4 and 5; started back the other way today. For the following three fill-ups, I was on Interstates I-64 and I-95, most of the way: cruise set at 74 mph. 1st 2 tanks reflect 5% non-highway miles; 3rd tank covers 30% non-highway. FWD, Tech Pkg. -Tank 1: 432 miles on 93 octane, 15.7 gals = calculated 27.5 mpg. -Tank 2: 431 miles on 89 octane, 15.8 gals = 27.3 mpg. On the first two fill-ups, I ran about 25 miles past the “0 Range” indication. With a 17.1 gallon-capacity tank, I was getting close at 15.8 gallons used. This tells me my copy of the RDX has the reserve to go only about 40-50 miles after “0 Range” is initially displayed. I won’t usually cut it as close as I did; the first time, I just forgot about how far it can be between stations in the swamps of SC (I-95 below Florence). The second time I was more comfortable: I knew that the range was available, and I knew where the next gas station was. 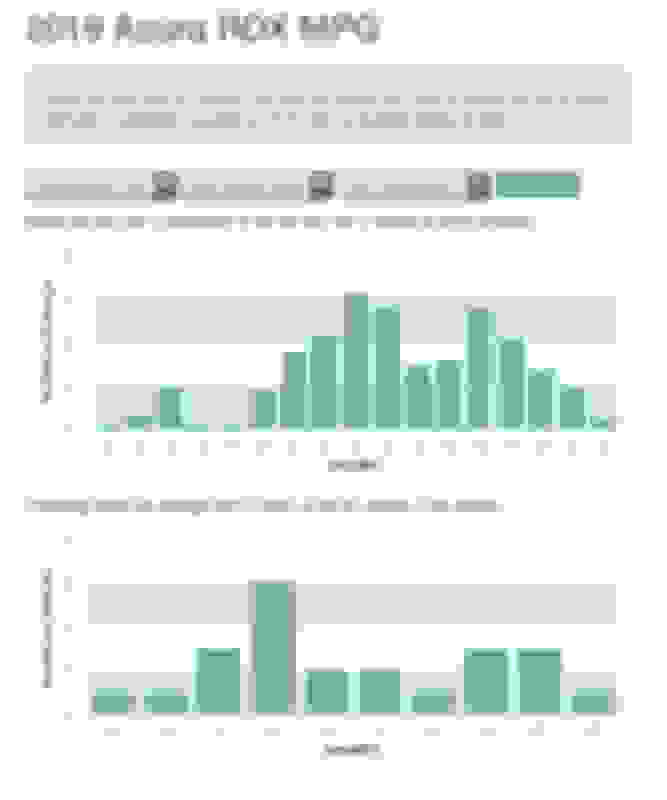 My total mileage so far, since purchase in June, per Fuelly.com: 7,203 miles tracked; 72% hiway, 28% city; 25 fill-ups; 24.8 mpg overall. What MPG have you been getting on your 2019 RDX? Reports have been coming in much less than the sticker is showing. Please add your experience (MPG / driving mode/ and MPH, etc.) This could be a great fact finding thread. Thanks. I didn't read this whole thread, but fuelly is going to be better data than a thread like this. I have 1500 miles, and am around 19.5 mpg life to date, usually in sport mode, and I run 93 octane. I live in the Bay Area so it's a pretty good mix of city & freeway driving. I drive in comfort mode 99% of the time. The auto off on idle was sometimes on, but most of the time it was turned off. Really, no change since last time. I am up to over 5000 miles and resetting my trip meter after every thousand miles. The last two 1000 mile increments I have been near 50/50 split between highway and city on flat midwest roads and am only averaging 20.5 to 20.7 in comfort mode. So far this has been the biggest disappointment in an otherwise great car. How fast are you driving on the highway. I drive 80 whenever I can, which probably isn't the best idea when it comes to gas mileage. But if I'm not going 80 on the highway I'm usually going 20-30 mph in bumper to bumper traffic, frequently slowing to 10 or stopping completely for a few seconds. Yesterday I drove 90 mi from Monterey to San Carlos through the Bay Area end of rush hour traffic without stopping, hills and highway, the mileage upon arrival showed 27.4 mpg in Comfort mode. i don’t drive like a granny, but i stay close to the speed limit. A picture i didn’t show was 1/2 through my trip, before i started the fun part of the drive, i was averaging 29.7. Most of the drive was in comfort mode. I have noticed that comfort and sport are pretty close on rpm, but sport + raises the rpm by about 500. I used to drive a hybrid, so i tend to try to time lights, i coast some going downhill, but not so much that i lose speed. Sorry i can’t give more suggestions, i have been driving like this for at least 13 years and it just seems to be automatic. I have had my RDX for about a month. It is the AWD and I extremely disappointed with the gas mileage. I drive in the comfort mode. Range is about 75% highway and am getting average 19.9. Told the dealer and they said have not heard that from other drivers. Advertised MPG is not standing up to actual driving. Any advise? I now have 4300km and 11 fills for an average of 11.1L/100km (21.7 mpg US) with about half being highway miles. Just put on my winter tires so I expect a bit of a drop in efficiency. SH-AWD - Tech. I am averaging between 20.1 and 20.8 with Premium gas from Costco. My driving is 90% city. A slight improvement since last time. My driving habits were the same. On this tank I will try to not go over 75 (I go 80 whenever I can). Hopefully, that will make a big difference. There was a slight improvement, but nothing to brag about. SH-AWD Tech Pkg. 666miles to date. Getting 20 mpg in combined city/highway, 50% comfort/50% sport. I record every fill-up on Fuelly; some folks only record a few. Here are the overall stats for the 2019 RDX (23 units in their database). here are stats on my 2019 FWD Tech, after 30 fill-ups. Overall Ave mpg is 25.0, with 24% city and 76% hwy driving. All the high “hilltops” are road trips; all the valleys and midpoints are normal, city/suburban driving. On the road I’m usually doing interstates at 70-75 mph. I drove mostly in comfort mode, like 99% of the time. I use idle stop when it does make sense, like driving down the strip with a lot of traffic lights. I tried to keep my top speed at 75, although there times I hit 80. I do live in the Bay Area, so the traffic here is pretty heavy and the commute to work involves a good amount of uphill driving. Going to work, maybe 2 out of 5 days, the traffic is pretty heavy and I have to drive 25-30 mph on the freeway with frequent slowing down. Going home is more downhill then uphill, but the traffic is worse, 3-4 days a week I'm driving 25-30 mph on the freeway with frequent slow-downs. Maybe 19-20 mpg is the best I can expect under these conditions? ...Maybe 19-20 mpg is the best I can expect under these conditions? Yep, uphill and stop-and-go are both serious killers of MPG. Have you considered early retirement? It would at least address the commute issue. I’m retired. I get about 22 in mostly suburban driving. Well, there's a car payment now. 19mpg here . 1000 miles on car with Shell 91, at 5500 ft altitude. Drive down hill 1000 ft and up 1000 ft when “going into town and back”. Always comfort mode. I've had the car for almost 2 months (picked up Oct. 20), with 2046 on the odometer. Actual MPG '07 TL-S 5AT ? ? 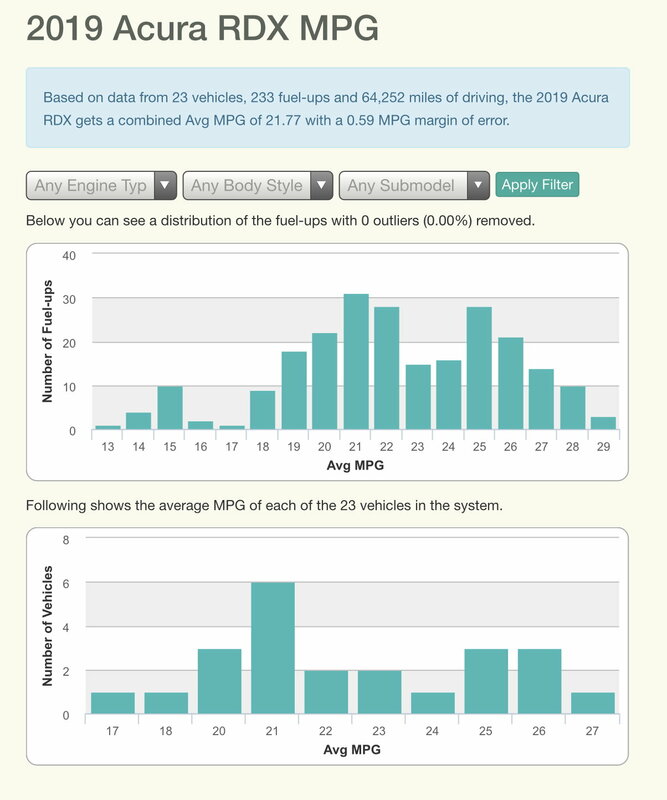 MPG Chart: Post in Your MPG Data!! How close is actual MPG compared to sticker.